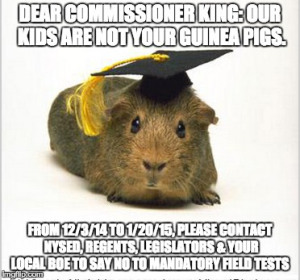 Contact Albany Now & Demand No Mandatory Stand-Alone Field Tests! 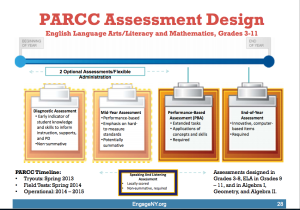 I have confirmed that NYSED will be “field testing” common core PARCC exams in our schools this Spring 2015. There have been some conflicting reports in the press about this issue. Therefore, I took the liberty of contacting Regent Research Fellow Kristin Huff to inquire. She was kind enough to reply advising that indeed, SED will begin field testing common core PARCC tests in schools in Spring 2015. 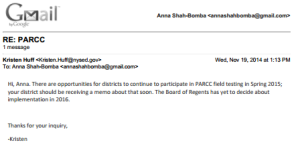 As you may be aware, PARCC is working on computer-based tests tied to the new Common Core learning standards. New York state plans to review the new tests to decide whether to adopt them to replace our existing tests. Next > Texting at the Board of Ed Table: Private Message or FOILable?